“Stunning Vang Vieng” is a private initiative that aims to promote Vang Vieng, its natural wonders and its cultural heritage. 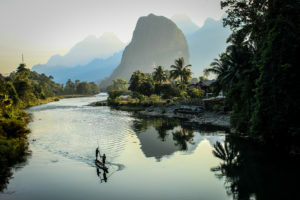 It advocates for an eco-friendly development that preserves what makes Vang Vieng so unique and attractive: its pristine landscapes of rice paddies and majestic karst mountains. In 2017, “Stunning Vang Vieng” organised a photo contest that concluded with a photo exhibition held successively at the Crowne Plaza Hotel, Vientiane, Riverside Boutique Resort, Vang Vieng, and the French Cultural Center, Luang Prabang. The exhibit can still be seen in Luang Prabang until the end of June 2018 at Cafe Ban Vat Sene and Coconut Garden. The next phase of the initiative will be the preparation of the first ever photography book about Vang Vieng. It is expected to be published in late 2018. “Stunning Vang Vieng” is generously supported by Riverside Boutique Resort, Vang Vieng; Exo Travel; Lao Airlines; Banque Franco-Lao; Phu Bia Mining; Champa Muanglao Magazine; Lifestyle Magazine; TVLao; Crowne Plaza, Vientiane; and, the French Embassy in Laos.